Endnotes, citations, and figures are available in the PDF version of this report. Voting is our nation’s most vital and widely used civic action. It is a critical way for citizens to communicate with leaders and indicate their will for the direction of the country. But while voting is of the utmost importance to the health of our democracy, state voting laws and county-based election administration vary greatly across the nation and can create barriers to voting and dramatically impact a citizen’s voting experience. The voter registration process, for example, is not the same in every state. While federal law sets standards for voter registration, some states go above and beyond the federal statutory requirements and make it easier for residents to register by offering procedures such as online registration and same-day registration. Other states, however, implement registration restrictions that actually make it harder for citizens to take this first step in the voting process. The voting experience and voting process also vary by county. Because the administration of elections is largely delegated to officials in the more than 3,000 counties or wards in the United States, a citizen’s voting experience can vary even within a state. From the ease of voter registration, to the maintenance of voter lists, to the number of voting machines, many county-based factors affect voters’ overall experience and their access to the ballot box. Citizens often focus on voting’s end result: casting a ballot in favor of a candidate or an issue. What they often fail to identify, however, are the many points within the voting process where state and local election laws and election administrators have a large impact on a voter’s overall experience. This report isolates several different factors that illustrate the variation in voter experience from county to county. By evaluating the differences in voting statistics at a county level, we can better understand the voting administration practices that work and encourage state and local officials to consider how they can improve the voting experience for their citizens. Florida was one of the states that received scrutiny for the voting barriers that its electorate faced throughout the 2012 general election. Leading up to the election year, Florida received a great deal of attention for passing restrictive voting laws that made it more difficult for citizens to register to vote and cast their ballots. In 2011, Gov. Rick Scott (R-FL) signed H.B. 1355, which made it significantly more difficult for citizens to vote by reducing early voting days, creating additional hurdles for voters who moved counties before the election, and heavily restricting third-party voter registrations. Gov. Scott also embarked on a highly controversial and error-ridden purge of voters from the state’s voter registration list. In addition to facing restrictive voting laws and a controversial voter purge, Florida voters had to deal with long lines at the polls on Election Day. Voters in 35 precincts in Lee County were still in line waiting to vote three hours after polling locations had officially closed. Meanwhile, reports from Miami-Dade County indicated that some voters in the county had to wait in line for seven hours to vote on Election Day. 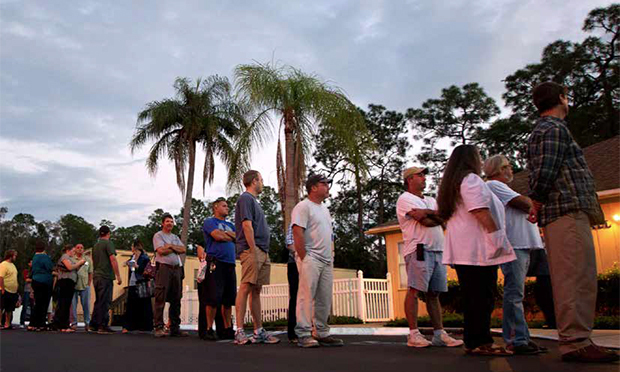 One study found that Florida voters faced the longest lines to vote in the nation. Many counties in Florida also experienced election administration issues. In Hillsborough County, for example, poor administration appears to have erroneously forced some of the county’s voters to vote provisionally; after all the votes were tabulated in the county, more than 2,100 provisional ballots were tossed out. In Palm Beach County, a printing debacle delayed the completion of counting absentee ballots until four days after the election. Because of Florida’s history of election problems and the multitude of problems that voters encountered during the 2012 general election, we went deeper to gain a better understanding of what happened in the state during the election. We examined concrete data that reflected voters’ experiences in the voting system and their ability to participate in the democratic process. Since many election decisions are delegated to county administrators, we wanted to examine how voting experiences varied from county to county and identify the counties that stood out for poor election administration. After comparing Florida counties with voting-age populations greater than one quarter of the mean Florida county citizen voting-age population, we found a wide deviation in the factors that define the voting experience from one county to another. This report identifies where some Florida counties are strong and others are weak and raises the question of why it is harder for a voter in Columbia County to participate in the democratic process than it is for a voter in St. Johns County. This report examines nine factors that reflect voters’ voting experiences and their ability to participate in the democratic process. We compared the performance of the most populous Florida counties by calculating the mean level of performance for each of the nine factors below and determining how far from the mean each county scored. The result is an objective ranking of Florida’s worst-offending counties for election administration. In addition to the overall worst-offender rankings, we identified the worst-performing counties within each factor to explore why certain counties may have performed better than others. The result is an in-depth analysis of the voting problems that plague Florida counties and make it harder for citizens to exercise their right to participate in our democracy. While all Florida counties had to contend in 2012 with restrictive election laws passed at the state level, six of the counties that we evaluated stood out for failing to ensure that residents could freely and effectively cast votes: Columbia, Putnam, Bay, Alachua, Hillsborough, and Duval. Nearly 2 million voting-age citizens live in these six worst counties. Columbia County in northern Florida was the worst-performing county overall and frequently ranked among the state’s worst counties on a variety of factors. Of the Florida counties examined, Columbia had the worst voter turnout of its citizen voting-age population, 53.5 percent. This corresponds to the fact that Columbia also had the lowest percentage of registered voters as a ratio of its voting-age population, the second-lowest percentage of eligible African American voter registration, and the third-lowest percentage of eligible Hispanic voter registration. It also had one of the highest percentages of absentee ballots rejected—nearly two times more than the average Florida county. Putnam County had the second-lowest percentage of overall voter registration, the third-lowest level of voter turnout, and was the third-most active county in removing voters from voter rolls. Bay County also fared poorly on numerous factors, but it was the worst offender with regard to the percentage of absentee ballots it rejected, rejecting more than two times the state average of absentee ballots. Alachua County removed a greater percentage of its registered voters than any other county other than Hillsborough—nearly two times the state average—and issued the third-highest percentage of provisional ballots in Florida. Hillsborough County had one of the worst average waiting times in the state. According to a report from Advancement Project, polls in Hillsborough had to stay open an average of one hour past closing time. Hillsborough also had the second-highest percentage of provisional ballots cast in Florida—more than twice the state average. This is concerning, considering that nearly 42 percent of the provisional ballots cast in the county—more than 2,100 votes—were rejected and not counted. Duval County had the highest percentage of provisional ballots cast in the state. This is also troubling because not all provisional ballots are actually counted. In fact, Duval rejected more than 34 percent—or more than 2,300—of the provisional ballots cast in the county. Although election officials point to the restrictive H.B. 1355 as the reason why Duval County had so many provisional ballots, every county in the state had to contend with the same law. The rate of provisional ballots used in Duval, however, is almost four times higher than the state average. The six counties highlighted above stand out for their poor election administration because they performed dramatically worse than other Florida counties. According to our analysis—which calculates each county’s standard deviation from the state mean for each of the nine factors—the sixth-worst county, Hillsborough, performed 60 percent worse than the seventh-worst county, Highlands. But while it is worth noting these extreme cases, all of the bottom-ranking counties deserve scrutiny for making it harder for people to participate in the democratic process. To better understand what makes voting different from one county to another, compare highlights from three of the factors we analyzed demonstrating how the good-, the bad-, and the average-performing counties fared in Figure 1. Table 1 ranks the Florida counties that we analyzed from the overall worst to the overall best-performing counties in election administration, according to the nine examined voting factors. Columbia County ranked as the overall worst offender, Marion County established the mean election administration performance, and St. Johns County performed the best. Anna Chu is the Policy Director for the ThinkProgress War Room at American Progress. Joshua Field serves as the Deputy Director of Legal Progress, the legal policy program at American Progress. Charles Posner is the State Communications Assistant in the ThinkProgress War Room.